Saniflo Solutions specialise in the service and repair of Saniflo Macerators in Dorking, Surrey. We have 15 years extensive experience of hundreds of different types of Saniflo systems. We understand that many problems can occur with Saniflo products and are here to help. We have been trading as professional plumbers and Sanflo engineers for the last 25 years, serving both commercial and domestic clients in Dorking and throughout Surrey. 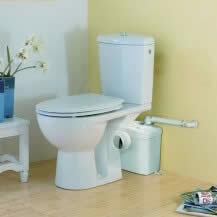 For the last 20 years we have specialised in repairs to Saniflo and other macerators. There is an extensive range of Saniflo products to meet exactly with your requirements. We can advise on the best product for the space available in your Dorking property.